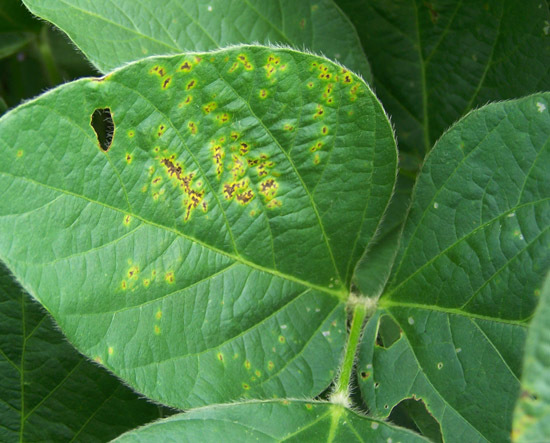 Leaf spots caused by the bacterial blight pathogen can be found in most soybean fields every year in the Midwest. They are most common during rainy, humid periods in July and August. The bacteria can also infect snap bean and lima bean. Bacterial blight is caused by the bacterium Pseudomonas syringae pv. glycinea. The disease can be confused with brown spot (Septoria leaf spot) and with bacterial pustule. Bacterial blight and brown spot are especially common. Both diseases often occur in the same fields and even the same plant, and symptoms can be difflcult to separate. 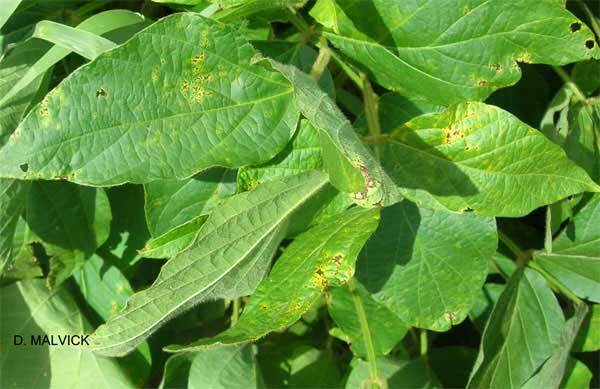 Bacterial blight generally occurs at low levels that do not limit yield. The bacteria that cause bacterial blight overwinter in crop residue and on seed. Initial infections can occur during seedling emergence, especially if infected seed is planted. The bacteria are spread by wind and rain, and outbreaks that occur later in the season often follow wiindy rainstorms. 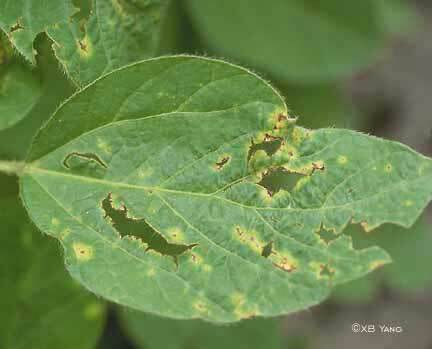 Bacterial blight is favored in continuous soybean fields, no-till soybean fields, or fields planted with seeds from infected soybeans. Bacterial blight is often confused with brown spot, a leaf spot disease caused by the fungus Septoria glycines. Bacterial blight occurs on upper new leaves and brown spot infection begins on older leaves, or leaves on the lower part of the plant. A characteristic yellow halo forms around lesions caused by bacterial blight (left). Symptoms of Brown spot (right) show up as more generalized leaf yellowing when numerous brown spots are present. Click on image to view a larger version. Photo: University of Illinois. 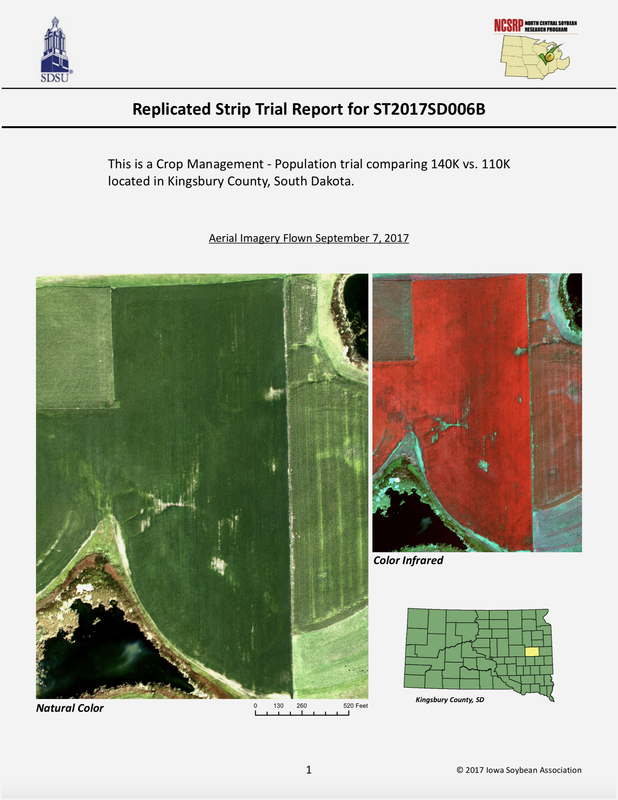 Bacterial blight occurs every year in the Midwest without causing significant yield losses except in unusually rainy growing seasons. However, bacterial diseases should be monitored carefully in seed production fields because they are seedborne and can affect seed quality. In severe cases, bacterial foliar disease may cause some early defoliation, but it will not kill whole plants. Severely affected plants may have smaller seeds. 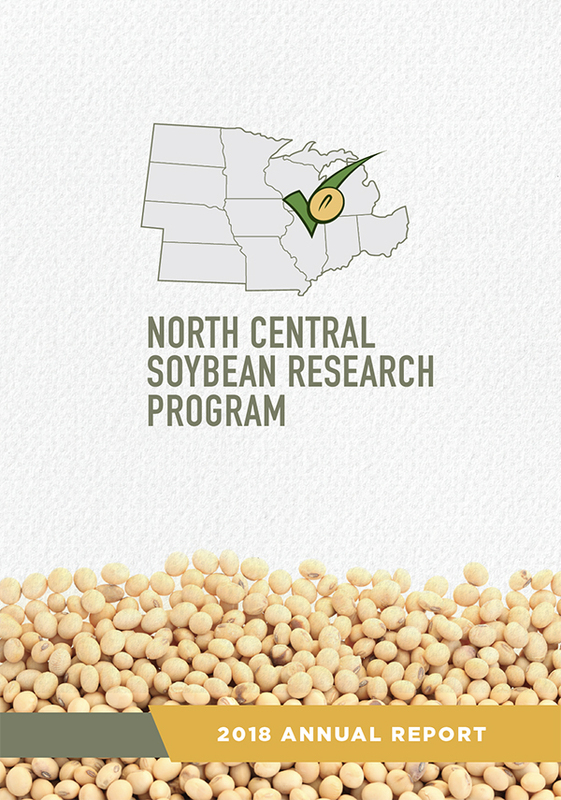 Soybean varieties differ in their susceptibility. Outbreaks typically develop several days after a rainstorm or hailstorm. Symptoms are most evident on new growth that is expanding at the time of the rain event. New lesions of bacterial blight are small, angular, water-soaked, yellow to brown spots on leaves. The angular lesions enlarge in cool (70-80° F), rainy weather and merge to produce large, irregular patches of dead tissue. The centers of these patches often drop out, giving infected leaves a ragged appearance. The bacteria can also infect stems, petioles, and pods. Cover soybean residues after harvest by tillage, if possible, or shred residue for quick decomposition. Plant pathogen-free seed. 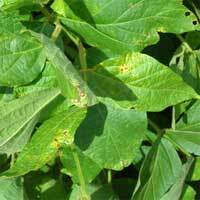 Do not use seed from plants infected with bacterial blight. Foliar fungicides will not affect bacterial blight because it is a caused by a bacterial pathogen, not a fungus. 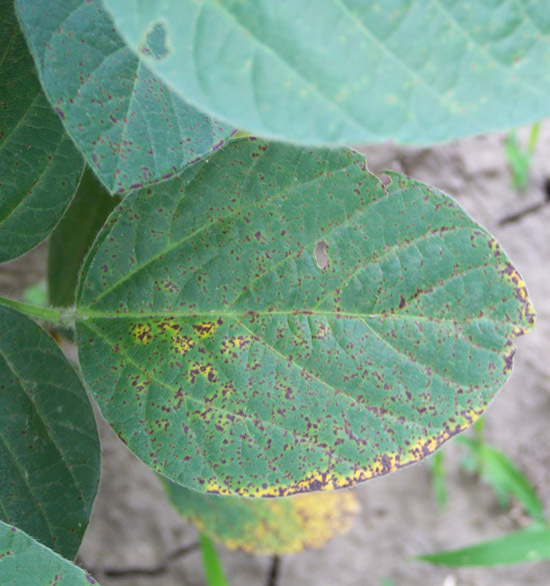 New lesions of bacterial blight typically develop after a rainstorm - Photo: Carl Bradley, University of Illinois.